an increase in the total red blood cell mass of the blood; called also erythrocythemia, hypercythemia, and hypererythrocythemia. There are two distinct forms of the disease: Primary polycythemia (polycythemia vera) is a myeloproliferative disorder of unknown etiology. 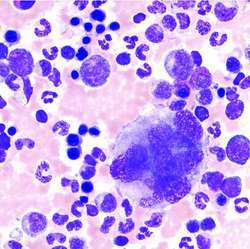 It is characterized by hyperplasia of the cell-forming tissues of the bone marrow, with resultant elevation of the erythrocyte count and hemoglobin level, and an increase in the number of leukocytes and platelets. Secondary polycythemia is a physiologic condition resulting from a deficient oxygen supply to the tissues. The body attempts to compensate for the deficiency by manufacturing more hemoglobin and erythrocytes. Living at high altitudes can produce polycythemia, as can severe chronic lung and heart disorders, especially congenital heart defects. Absolute polycythemia refers to an increase in red cell mass from any cause. Relative polycythemia refers to a loss of plasma volume causing an elevated hematocrit. Symptoms. The symptoms of primary and secondary polycythemia are much the same. The increased erythrocyte production results in thickening of the blood and an increased tendency toward clotting. The viscosity of the blood limits its ability to flow properly, so that the supply to the brain and other vital tissues is diminished. This may cause sluggishness, irritability, headache, dizziness, fainting, disturbances of sensation in the hands and feet, and a feeling of fullness in the head. There may be episodes of acute pain as spontaneous clots occur in the blood vessels. The spleen becomes enlarged and the smaller veins become more prominent, so that the skin has a bluish hue. The secondary form is often accompanied by enlargement of the tips of the fingers (clubbing). Treatment. Treatment of polycythemia vera is aimed at reducing the red cell count and decreasing the blood volume. Mild cases can be managed by periodic phlebotomy. More serious cases may require myelosuppressive therapy; interferon and large-dose aspirin therapy may also be used. Research on treatment modalities is ongoing. In secondary polycythemia, successful treatment of the causative illness will relieve the polycythemia. The presence of an abnormally high number of red blood cells in the circulating blood. /poly·cy·the·mia/ (-si-thēm´e-ah) an increase in the total cell mass of the blood. absolute polycythemia an increase in red cell mass caused by increased erythropoiesis, which may occur as a compensatory physiologic response to tissue hypoxia or as the principal manifestation of polycythemia vera. relative polycythemia a decrease in plasma volume without change in red blood cell mass so that the erythrocytes become more concentrated (elevated hematocrit), which may be an acute transient or a chronic condition. secondary polycythemia any absolute increase in the total red cell mass other than polycythemia vera, occurring as a physiologic response to tissue hypoxia. stress polycythemia chronic relative polycythemia usually affecting white, middle-aged, mildly obese males who are active, anxiety-prone, and hypertensive. polycythemia ve´ra a myeloproliferative disorder of unknown etiology, characterized by abnormal proliferation of all hematopoietic bone marrow elements and an absolute increase in red cell mass and total blood volume, associated frequently with splenomegaly, leukocytosis, and thrombocythemia. A condition characterized by an abnormally high number of red blood cells in the blood. A condition marked by an abnormally large number of red blood cells in the circulatory system. an increase in the red blood cell count and circulating red blood cell mass that may be primary or secondary to pulmonary disease, heart disease, or prolonged exposure to high altitudes. Also called Osler's disease, polycythemia vera. 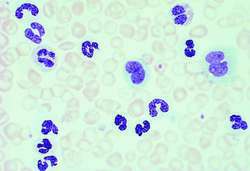 Compare hypoplastic anemia, leukemia. See also altitude sickness, erythrocytosis. observations Clinical manifestations for polycythemia include weakness and fatigue; headache and vertigo; visual disturbances (scotoma, double or blurred vision); dyspnea; nosebleeds; night sweats; and epigastric and joint pain. Later signs include pruritus, clubbing of digits, a reddened face with engorged retinal veins, and hepatosplenomegaly. Secondary polycythemia may display hypoxemia in the absence of hepatosplenomegaly and hypertension. Lab results in primary polycythemia include elevated red blood cell counts; elevated white blood cell counts with basophilia; elevated hemoglobin; thrombocytosis; elevated alkaline phosphatase, uric acid, and albumin, and elevated histamine levels with low serum erythropoietin levels. Bone marrow aspiration shows panmyelosis. Thrombosis, cerebrovascular accident, peptic ulcers, myeloid metaplasia, leukemia, and hemorrhage are common complications in primary polycythemia and result in the death of about 50% of untreated individuals within 18 months of the appearance of symptoms. The median survival rate in treated individuals is 7 to 15 years. interventions Management of secondary polycythemia is directed at treating the underlying causes. The treatment for primary polycythemia is directed at reducing blood volume and viscosity and inhibiting bone marrow activity. The treatment mainstay is serial phlebotomy and is used to reduce RBC mass. Hydration therapy is used to reduce blood viscosity. Chemotherapeutic agents may be used to induce myelosuppression. Adjunctive therapy includes allopurinol to treat hyperuricemia, antihistamines to reduce pruritus, analgesics for joint pain, and antacids for gastric hyperacidity. A splenectomy may be indicated to treat resistant splenomegaly. nursing considerations Nursing during the acute phase includes careful monitoring of intake and output during hydration therapy and phlebotomy to avoid overhydration or underhydration. Comfort measures are instituted to relieve joint pain, itching, and heartburn. Passive and active range of motion and ambulation are used to promote circulation and prevent thrombus formation. If chemotherapeutic agents are used, education is needed about effects and side effects. Education is also important, and stress is placed on the chronic nature of disease, the need for long-term phlebotomy treatment, and the impending complications that will occur if the disease is left untreated. 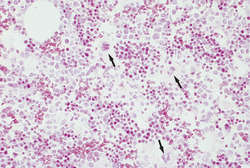 Any ↑ RBC mass. See Relative polycythemia, Secondary polycythemia. Relative RBC mass is above normal but not pathologic. See Relative polycythemia. Neoplastic, ie polycythemia vera, see there . ;. An abnormal increase in the number of red blood cells. A relative (rather than an absolute) increase in the number of erythrocytes due to a reduction of plasma volume, e.g., in patients with burns or dehydration. Polycythemia due to a physiological condition that stimulates erythropoiesis, e.g., lowered oxygen tension in blood. A condition characterized by an overabundance of red blood cells. n an increase in blood volume as a result of an increase in the number of red blood cells, the erythrocytes. It may result from a blood-forming disease that increases cell production, or it may be a physiologic response to an increased need for oxygenation in high altitudes, cardiac disease, or respiratory disorders. n the drawing of blood to check for an overabundance of red blood cells. n an overabundance of red blood cells due to plasma loss. Recombinant human EPO treatment in EPO-induced polycythemia and curcumin + EPO-induced polycythemia groups: Animals received three subcutaneous injections weekly of EPO (300 IU/kg) (SEDICO, Egypt). Patients with JAK2 negative polycythaemia were tested for the cause of polycythemia. Contribution of polycythemia to pulmonary hypotension in simulated high altitude rats. Spontaneous hyperdense intracranial vessels seen on CT scan in polycythemia cases. A snapshot of the global therapeutic scenario for Polycythemia Vera. In our case, it is noteworthy that there was a previous diagnosis of polycythemia vera, which has not previously been reported with NDDH, but only described in association with the classic form of Sweet's syndrome (4). This report provides insights into the up-and-coming trends of the acquired orphan blood disorder pharmaceutical market by examining Idiopathic Thrombocytopenic Purpura (ITP), Myelodysplastic Syndrome (MDS), Myelofibrosis (MF), Paroxysmal Nocturnal Hemoglobinuria (PNH) and Polycythemia Vera (PV) in seven major markets: the US, the top five European countries (France, Germany, Italy, Spain and the UK) and Japan. The clinical phenotype of wild-type, heterozygous, and homozygous JAK2V617F in polycythemia vera. Steve contracted dengue fever and had polycythemia, which caused his liver to inflate. Splenic rupture following administration of thrombolytic agents has been reported in the presence of myeloproliferative disorders, such as polycythemia vera (7) and in those with splenomegaly secondary to infection (8).